(Nanowerk News) A European research team including experts in nanotechnology, optoelectronics and quantum physics has advanced the state of the art in the emission, manipulation and detection of single photons on semiconductor platforms. They achieved several breakthroughs, including a new record in quantum dot spacing, and their pioneering work brings a wide range of single-photon and quantum applications a significant step closer. The ultimate in semiconductor miniaturisation is to use single photons and electrons to carry and manipulate information in the form of quantum bits or qubits. Researchers from some of Europe’s leading universities, public research institutes and industry-based labs have combined forces under the aegis of the EU-funded QPHOTON project to create new semiconductor-based devices that reliably and efficiently emit, detect and allow the manipulation of single photons. SEM image of an electrically contacted micropillar, which was cut into half by ion beam milling. The suite of devices QPHOTON developed may enable multiple applications including low power, highly integrated photonic circuits; practical quantum cryptography and teleportation; and, eventually, new routes to realise ultra-powerful quantum computers. One of the consortium’s key goals was to improve the assembly and control of semiconductor-based quantum dots. Quantum dots are nano-sized structures that can confine electrons in three dimensions. By manipulating the size, shape and composition of the dots, researchers can gain very fine control over their electronic and optical properties, for example triggering them electronically to emit single photons. Until now, most quantum dots have been grown through self-assembly, which leaves the dots scattered randomly in a solution or across a surface. The researchers developed a series of cleaning and deposition steps that allowed them to grow high-functioning dots where they wanted them, and, in the process, achieved a new record in terms of the density of quantum-dot spacing. More importantly, however, the researchers were able to link those quantum dots to other nano-structures in order to enhance and exploit their properties. They found ways to combine the precisely spaced dots with minute vertical pillars and horizontally aligned microcavities, both of which emitted single photons far more efficiently and reliably than the previous state of the art. The pillars emit light perpendicularly to the surface of the semiconductor. They can be used as robust sources of single photons, which could for example be coupled to optical fibres for long-distance transmission. 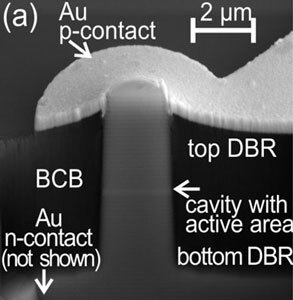 The horizontal microcavities are extremely promising as key parts of highly integrated circuits that would use photons rather than electrons to process information. The researchers also developed an innovative vertical photonic crystal assembly to extract single photons from these circuits with more than 80 percent efficiency. Another major innovation was the development of “photonic wires” – precisely assembled linear structures that advanced the state of the art by a factor of two in terms of the efficiency of transmitting single photons. “Pushing the coupling efficiency to about 85 percent is a major breakthrough for single photon emitters,” says Reithmaier. This advance is particularly promising for the secure distribution of quantum keys, which enable ultra-secure data transmission. Only by sending one photon at a time can information be transmitted without any risk of it being compromised. For the past ten years, researchers worldwide have been avidly exploring the field of slow light. A variety of nano-structures have been found to have the ability to slow light dramatically. Engineers hope to use this effect to create memories, buffers and switches for high-powered, energy-efficient optical computers. The QPHOTON researchers chalked up another first by demonstrating a strong slow light effect in a semiconductor quantum dot material. Most previous research with slow light used media – gas for example – that would not be useful in actual computers. So showing that quantum dot arrays can slow light in a semiconductor is potentially very important for optical computing. Reithmaier cautions that the ability of slow light to carry enough information to support optical data processing has not yet been demonstrated, and may turn out not to be possible. Still, QPHOTON’s findings will be utilised in a new EU-funded project aimed at further exploring the potentials of slow light. Reithmaier believes that the steps they’ve taken to control the emission, manipulation, and reception of single photons bring practical quantum computers significantly closer. The QPHOTON project received funding from the FET – Open strand of the EU’s Sixth Framework Programme for research.